Indian Vegetarian Recipes, easy Indian recipes: This Indian recipe is made with a little bit of red chill powder on the inside to give it a little kick. 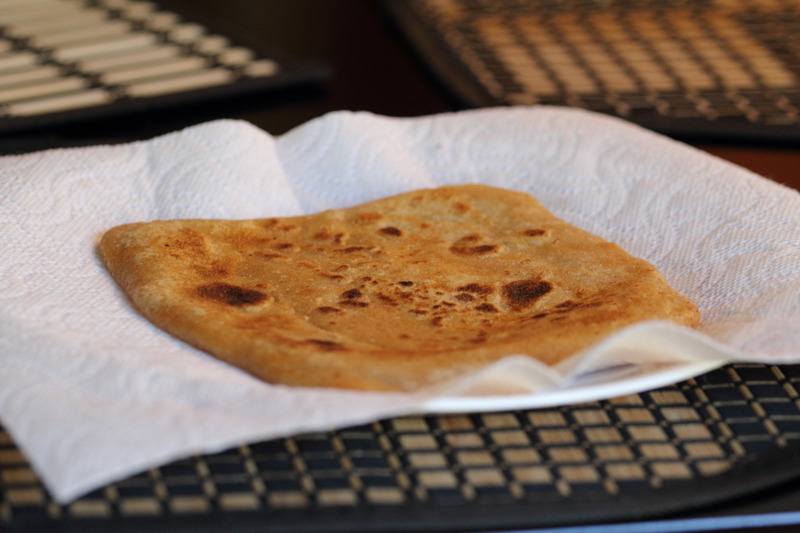 Paratha is a delicious Indian bread that’s regularly eaten. In this version, there’s a little bit of red chili powder added to the center. This easy Indian recipe can be enjoyed with a hot beverage like chai. Add 2 cups of white flour to a bowl. Add a pinch of salt. Add 1 to 1 ¼ cups of water. Knead the dough until you get the proper consistency. The dough should not stick to your hands. If it does, sprinkle some more flour on top. Cover dough with a damp towel so dough does not dry out. Let the dough sit for 20 minutes at room temperature. Make a ball with the dough about the size of your palm. Flatten the dough with your hands. Roll dough into flat circle. Add a teaspoon of oil. Add a dash of red chili (or whatever you prefer). Fold the dough into a rectangle, and then fold it into a square. The red chili and oil should be completely in the middle and not leak out. Roll the dough once again to form a larger square or circle. Pre-heat pan on stove on medium or medium-high heat depending on your stove. Add rolled dough with chili to the pan. Let it heat for approximately 30-40 seconds depending on your stove. Flip dough to other side. Let it heat for approximately 30-40 seconds depending on your stove. Add oil to the surface of the pan underneath the bread and not on top of it. Let it cook until bread is medium or dark brown depending on your personal preference. Repeat steps 5-16 until dough is finished. Serve.